On 22th June 1865, the first horse-drawn railway began operating in Germany, after they had already been introduced in Swansea (1807), Gloucester (1809), New York (1832), Paris (1855), Boston (1856), Havana (1858), Santiago de Chile (1858), Rio de Janeiro (1859), Alexandria (1860), Sydney (1861), London (1861) and Cape Town (1863). The new service, operated by the Berlin Horse Railway Company (founded 1864), connected the city of Berlin with Charlottenburg and promised numerous advantages over the existing horse-drawn omnibus including, among other things, much greater comfort. Berlin grew in size during this period due to the unstoppable influx of new residents from the surrounding countryside following industrialisation and the creation of jobs. In turn the freight to be transported also increased rapidly. Road conditions prevented smooth running buses and so alternatives started to be discussed. It was soon realised that transport systems based on rails could meet these requirements far better. The smoother journeys and better distribution of weight loads provided by the marginal friction between wheels and rails therefore enabled mass transport in its truest sense. However the costs of track construction were very high and as such they were not authorised quickly. This explains why a number of attempts were needed to implement the ambitious project. Another obstacle was the Berlin customs and excise wall, which had surrounded the city as a tariff border for the contribution of the excise tax since 1737. In 1865, this wall had already largely lost its function because of numerous territorial expansions. Thus, King William I agreed to its demolition by cabinet order in August 1865 and the way was cleared for a new era in the city’s public transport. In the first year of its operation, the horse-drawn railway already recorded 950,000 passengers. This ridership was possible partly because eighteen cars with around 130 horses were available for the single-track line and its numerous sidetracks. Horses could provide about three hours of service time each day. There was always a need for reserve horses because two horses usually drew each vehicle. These developments also heightened the importance of Charlottenburg, a town which was growing in size and whose economic boom has just began, especially because many companies had taken up occupancy there (and in other periphery towns) as a result of the increasing scarcity of land in Berlin’s centre. Similar forces affected the big locomotive manufacturers like Borsig and Schwartzkopff whose factories were formerly located on the outskirts on Oranienburger Thor, as it was known until 1865, at a site called Feuerland (fire-land) but then moved to the northern periphery of Tegel. The arrival and departure of these factories’ workers had therefore to be ensured through the provision of vehicles suitable for mass transport. After an initial pause, Berlin soon saw the opening of a number of new horse-drawn railway lines that were built and operated by the Great Berlin Horse Railway Company that was founded in 1871. Capital for these lines was not difficult to come by because the German Reich experienced an economic boom (the so-called ‘Gründerzeit’) after its victory over France in 1871, which in turn can be recognised as having had an enormous positive effect on technological development in the country. Soon other companies entered the market, like the New Berlin Horse Tram Company (founded 1873, figure 1). Due to the continuous growth of the capital, horse trams eventually reached their capacity and load limits and so alternatives were sought. Amongst these alternatives were steam-powered trams but the soot they created undermined their promise and the complaints of residents soon led them to be abandoned. Then in 1879 an important milestone was reached when Werner von Siemens unveiled an electric locomotive at the Berlin Trade Fair, after discovering the principles of electrodynamics in 1866. Already at this time it was possible to imagine the new technology’s further use for horse-drawn tramways. Only two years later the first electric tram line in the world was opened. For its development Siemens found a disused railway that had been built to aid the construction of a military school in Gross-Lichterfelde, a suburb of Berlin. The power supply was provided through the two rails of the track, a risky business because horses could potentially receive electric shocks through their metal horseshoes. For other safety reasons the tramline’s level crossings were operated without an electric current and the tram were simply rolled across them to the other side, where the current was made available again. As this was still not the final solution, experiments were carried out using overhead cables in tubes to provide the power supply. However, this system, which relied on a slotted tube catenary, was also ultimately not suitable for mass transport. The breakthrough came when Walter Reichel invented the Lyrabuegel pantograph – a mechanism mounted on the roof of the vehicle that collects power through contact with the overhead wire – in 1887. Reichel’s invention encased the overhead wire and ensured the constant transfer of power through a continued contact pressure. In this way, switches and crossings became easy to transvers. The “Elektrische” [‘Electric’], as the Berlin tram became known, was now complete and ready for mass transport. In 1895 the Siemens and Halske Company successfully established its own tramline. This placed the Great Berlin Horse Railway Company under great pressure and led to the the negotiations of a consent agreement with the Magistrate of Berlin for the electrification of all horse-drawn tramlines. This was achieved by in 1902, with the last horse-drawn tram running until that time between Potsdamer Straße and Wedding. As the horse-drawn railways gave way to the electric trams, the company’s name also changed into “Große Berliner Straßenbahn Gesellschaft” [“Great Berlin Tram Company”] (GBS). 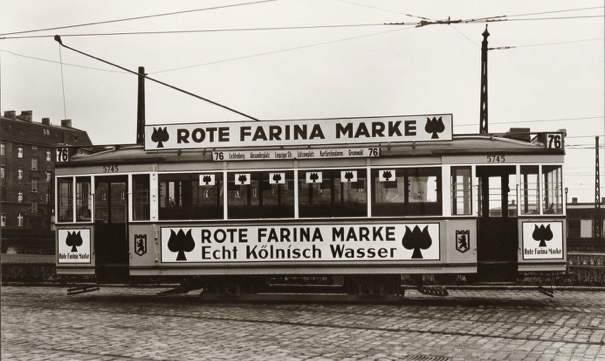 Due to their claims and negotiations with the Magistrate of Berlin about line concessions, new routes and fares, the Magistrate of Berlin began to integrate all of the municipal tram companies under one administrative authority. Before this was achieved, the Straßenbahnen der Stadt Berlin [Berlin Municipal Tramway] (SSB) was established, which used the Lyrabuegel unlike the GBS which used the American roll panthograph system. These two systems required overhead cables that were built differently so that at the points that were shared by several companies overhead lines for each system were stretched in all directions. The negative visual impact of these webs of wires and the desire not to spoil the appearance of the Unter den Linden boulevard should led to the inauguration of the Linden tram tunnel in 1916. Beyond this, however, the First World War hampered any further developments. After the war the north-south route of the U-Bahn C Line drew the majority of the traffic from the north-south tram lines, resulting in the partial closure of the Linden tunnel in 1923. Due to the continuous decline of the German Reich’s currency the municipal tram company “Berliner Straßenbahn” came into financial difficulties and had to be liquidated. As such Berlin experienced a tram-free day on 9. 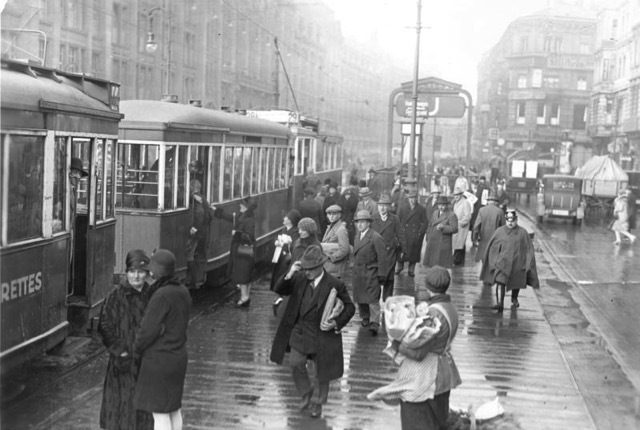 September 1923 but one day later, the “Berliner Straßenbahn-Betriebs GmbH” began operating a service on 32 lines – still a stark contrast to the 85 that had previously served the city. In the following years the renewal and standardisation of rolling stock became a priority. Due to the lack of money and a high demand for new carriages new design specifications recommended simple double axle vehicles. A first batch of 500 motors and 500 carriages was delivered and proved themselves robust and well suited to their task. These T24/B24 series vehicles were extended due to high demand but were also refined and designated as the T25/B25 series (Figure 2). The color scheme of the T24/B24 was entirely new: a yellow chassis, interrupted only by the white colour of the carriage’s window frames. This colour scheme soon contributed to the identity of the Berlin Transport Company (BVG) that was founded in 1928 and was eventually applied to all tramcars in passenger service. In addition, huge efforts to modernise the oldest tramcars were undertaken, which were rebuilt to close their open sections, in part to solve the problems they presented during winter. These retrofitted tram carriages, the Berolina series which were built before 1900, were still indispensable for the networks operation. They were modernised to become the U3L series, which was then used until the mid-30s (40 years of use). Until 1929, the positive trend continued, culminating in the network carrying a record number of passengers – 929 million on 624 km of track as compared to around 175 million passengers on 190 km of track today. After this, due to the onset of the global economic crisis, simmilar performance levels could not be maintained. In the following years of dictatorship the first track closures in the city center (Charlottenburger Chaussee, Großer Stern) came into effect. In addition, the trams’ yellow and white colours gave way to an ivory beige. The high demand for vehicles for the 1936 Olympic Games led BVG to speed up the reconstruction and modernisation of those vehicles that they had previously withdrawn from service in the three years leading up to the Games. This process especially benefited the TM33, TM34 and TM36 series which had been earlier withdrawn from public service due to problems with their brakes and electic components. After this the onset of the Second World War then prevented any major changes to the tram network. Given the extent of the tram network’s destruction during the Battle of Berlin its postwar reconstruction was achieved in a remarkably short amount of time. The longest line interruptions were mainly due to the numerous bridges that had been blown up in the last days of war. A result of this destruction was that the network could now be modernised in a more fundamental way. For example, throughout the network the American-styled roll pantographs were replaced by new pantographs, which did not jump from the overhead line and had a higher contact pressure than even the former Lyrabuegel. Just seven years after the war, the tram networks in the two halves of the city began to develop differently even though at this time the city was still yet to be physically divided. In West Berlin, in 1953 the Senate took the momentous decision to transform a fleet of 40 trams and 20 buses into a fleet of 120 buses. The main reasons for this decision were, firstly, the increase in individual motorisation and the necessary road surfaces, and secondly, the significant operational flexibility offered by non-rail modes of public transport. Due to the planned decision to abolish the tram in West Berlin, for the most past no major investments in the network were made in the early 1950s and the maintenance of the network’s rolling stock was curtailed in a so-called ‘drive to wear’ strategy. However, there were two exceptions to this: four large capacity tram carriages were ordered in 1952 and the TF50 tram series was constructed using the components of war-damaged vehicles. Until 1963 the western BVG explained each tramline closure, often as a consequence of its extension of the U-Bahn network, but after this date no further explanations were given. In contrast, in post-war East Berlin the tram fleet was slowly modernised through processes of reconstruction. For example, the so-called Rekowagen, reconstructed tram carriages, were introduced. In actuality, these carriages were essentially new, but East Germany was not authorized to build new trams within the Council for Mutual Economic Assistance framework – instead it was expected that all new trams in the eastern bloc were to be supplied by Czechoslovakia. In this way the name Rekowagen was adopted to suggest the conversion of existing trams and in order to overcome the problem that Czechoslovakia’s tram building capacity was insufficient in meeting East Germany’s tram needs. The eastern part of Berlin also pursued the goal of a car-friendly city. So numerous tram routes in the center, including the Alexanderplatz tramline, were closed. Not until the early 1970s were the advantages of opening new residential areas on the outskirts of the city with quick tram links recognised. The benefit of this type of urban and transport planning lay partly in the fact that trams could be constructed at a much lower cost and strain on resources than surface or underground municipal railways. Thus, in contrast to the trend in the other half of the city, East Berlin expanded its tram network. In turn, 583 new tram carriages – the KT4D(t) series Tatra trams – were ordered from Prague to run on these lines. In addition to these new lines the network was also improved through the designation of tram only routes and the establishment of trams’ right of way over private cars at unregulated intersections and junctions, which enabled higher average speeds. In all, from 1977 to 1989, the East Berlin tram network grew to cover 182 km. With the fall of the Wall in 1989 and the unification of the East and West transport networks the first discussion of the complete removal of the city’s entire tram network arose. However, this plan was discarded because of popular protests against it and the lack of underground routes in the eastern parts of the city. After 1993, plans for the first extension of the tram network in the former western sector emerged, and one line was opened gradually between 1995 and 1997. The newly built green track routes today underline the modern approach of environmentally friendly transport and have contributed significantly to the improvement the amenity value of the inner city as well as peripheral urban locations (Figure 3). The modernisation of the fleet was also a major milestone in achieving increased user requirements relating to accessibility, comfort, reliability and punctuality. With the inauguration of a tram link to Berlin’s new main train station in 2014 and the full opening of all missing feeder routes planned for late August 2015, the process of connecting the two halves of the city by tram will come to an end. Then perhaps the city’s transport politics will see these important innovations extended to former West Berlin, in the interests of good network links and in the pursuit of modern and ecologically sustainable neighborhoods for all Berliners. 2015 also saw extensive celebrations of the Berlin tram’s 150th anniversary. On the actual anniversary, June 22, there was an official ceremony at Alexanderplatz with an exhibition of historic trams, lectures, interviews with historians and tram drivers, a model of the first horse-drawn railway and the cutting of a birthday cake. The following weekend, interested visitors had the opportunity to discover the depot in Lichtenberg and particpate in an interesting program of events including the opportunity to drive a.tram – a dream come true for hundreds of enthusiasts. The anniversary’s overall highlight was a parade of 11 historic trams from the depot in Lichtenberg to Alexanderplatz and back on 28 June. The whole population of Berlin seemed to pay tribute, as the streets were crowded with people along the entire route. 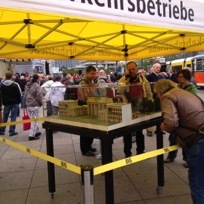 In preparation for these commemorative events, BVG had provided the association for preservation of historic trams Berlin (DVN e.V.) with a workshop and support in order to restore a large capacity tram carriage (built in 1961). Even an original preserved horse wagon could be visited. The only thing missing was the repetition of a horse drawn service with real horses – an option that might have been possible given the fact that around the depot in Lichtenberg the rails are embedded in asphalt. In all these events made it apparent that even as the city and BVG looks to the future it respects the importance of reflecting on the past. In turn it is interesting to think what the state of the tram network might be at the next milestone anniversary in twenty-five or fifty years.